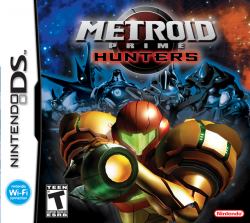 The famous Metroid series lands on the Nintendo DS with Metroid Prime: Hunters. A once-strong race has gone extinct, leaving powerful artifacts to be found by bounty hunters from across the galaxy. The game features a variety of bounty hunters, both old and new, to the series. It also features multiple competitive game modes--such as deathmatch and king of the hill--for battling wirelessly with up to three other players.